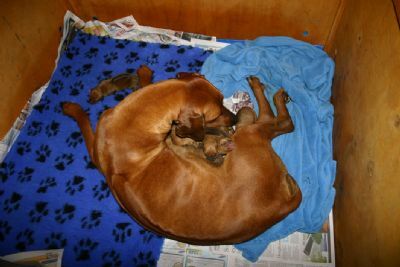 Our two much loved girls Ch Sanyati Persephone (Peggy) and Ch Veldthund Safiya (Safi) have now both given birth to 19 healthy puppies between them. 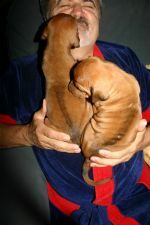 The dad of both litters is our handsome Ch Marmatia Gunella Gusto (Gus). You can see all three dogs on this website. This is the third litter to Peggy by Gus and has produced the same wonderful high standard as the first two litters. 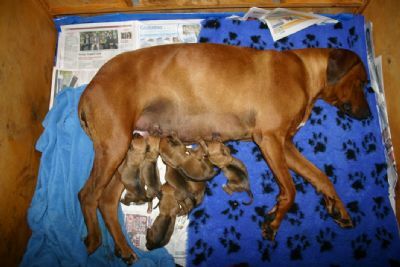 Safi has had her first litter. She is a truly delightful girl with a great attitude. 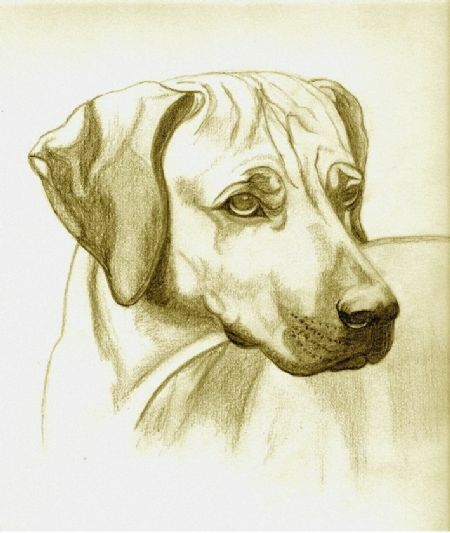 Gus compliments her beautifully as a proven sire and the puppies are lovely. Our dogs live together on our seven acre property in the Hawkesbury Valley, the perfect place for healthy happy Ridgebacks. 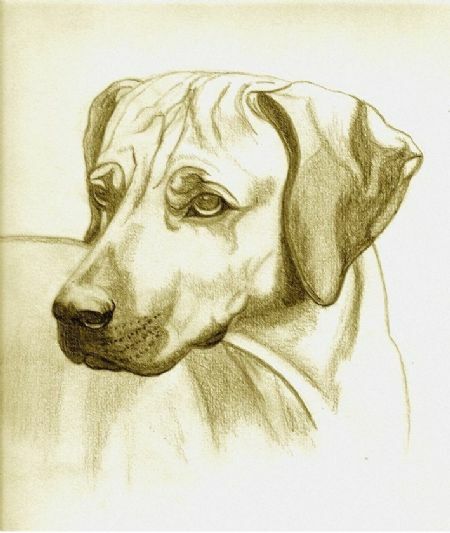 Known for their great temperaments, sound structure and good looks our dogs are much admired by pet owners and the show community alike. Enquiries are always welcome. Best of Breed at the Sydney Royal on 19/4/11. and successful dogs in their own right. At 17 days old Safi is a wonderful Mum. Two Safi pups thought Chris' beard looked familiar. Great ridges. At 19 days old Peggy's pups show that her litter has great ridges too. Four of Peggy's pups at 20 days old. 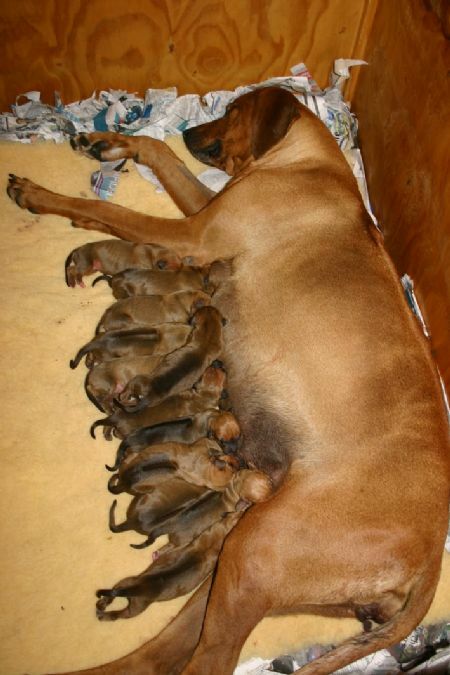 Peggy with her 12 Puppies. 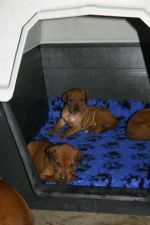 Safi's puppies first day outside in their kennel. 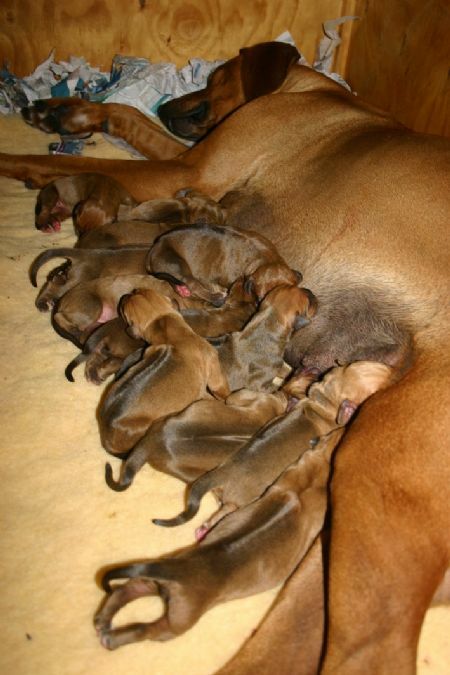 Safi's puppies first meal. Do you eat it or wear it?